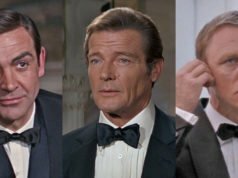 The black three-eyelet derby—known as blucher to the Americans—is worn by James Bond with his suits throughout Dr. No and From Russia With Love. 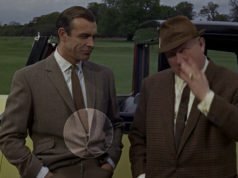 In Goldfinger, Bond switches to a two-eyelet derby with his glen check suit. On derby shoes, shoelace eyelet pieces are sewn on top of the vamp. 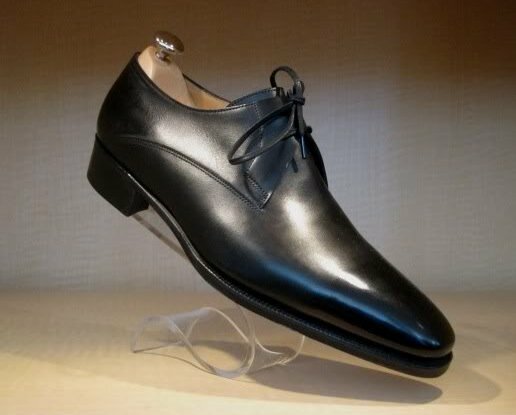 Daniel Craig wore this style with two eyelets (specifically the now discontinued John Lobb Luffield, pictured below) in Casino Royale with his dinner suit, in ordinary calfskin nonetheless. Derby shoes with two or three eyelets extend the vamp to give shoe long, sleek lines. This style can be found from most English shoemakers yet it is difficult to find in America. 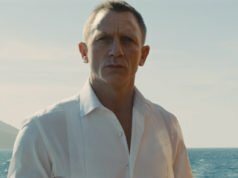 Bond’s shoes usually either have a cap toe or plain toe. In Diamonds Are Forever Bond wore a full brogue, wingtip three-eyelet derby with his black suit and blue pinstripe. Especially in a plain-toe style, it’s an elegant and minimal design well-suited to the James Bond character. "[The plain-toe, two-eyelet blucher] can be found from most English shoemakers yet it is difficult to find in America." The "Andrea" from Ferragamo is remarkably similar to the one under discussion. Available at Bloomingdales for sure, possibly at Nordstrom too. I've seen the Andrea in a store maybe once. It's a nice shoe though quite overpriced. It retails for $530, but if you catch a sale at Bloomies (like the one that just ended), you can get it for $371. But for that price a lot of the English shoes are still better quality and Goodyear welted. I also prefer the English lasts, but that's a personal preference. the biggest problem I have always had with two eyelet derby has been that the laces seem to come undone faster than with regular oxfords (balmorals)!!! not something Bond would have appreciated in real life!!! Michael, I have to do that with some of my shoes/shoelaces but reluctantly so. It just doesn’t look as nice. Being a Commander, Bond would know his way around a reef knot and need not worry about his laces. The literary Bond abhorred laces. The style Bond wore in Goldfinger’s laser scene would be to literary Bond’s tastes. Picked up a pair of ted baker haked 4 oxfords around $100 at DSW. Look the part and are comfortable. Not a fan of black shoes but it suits Mr.Bond nicely. A pair of 2-eyelet derby in brown alligator is on my current wish list. Yum. Matt, you said in your article that Bond’s derby shoes either have a cap toe or plain toe. I was only able to find cap-toe derbies in Spectre (Crockett & Jones Norwich), due to high-resolution photos. Do you by any chance know if Connery wore any cap-toe derbies? Yes, Connery wears cap-toe derbys in From Russia with Love. The same shoes may also be in Dr. No. You’re right, Matt. 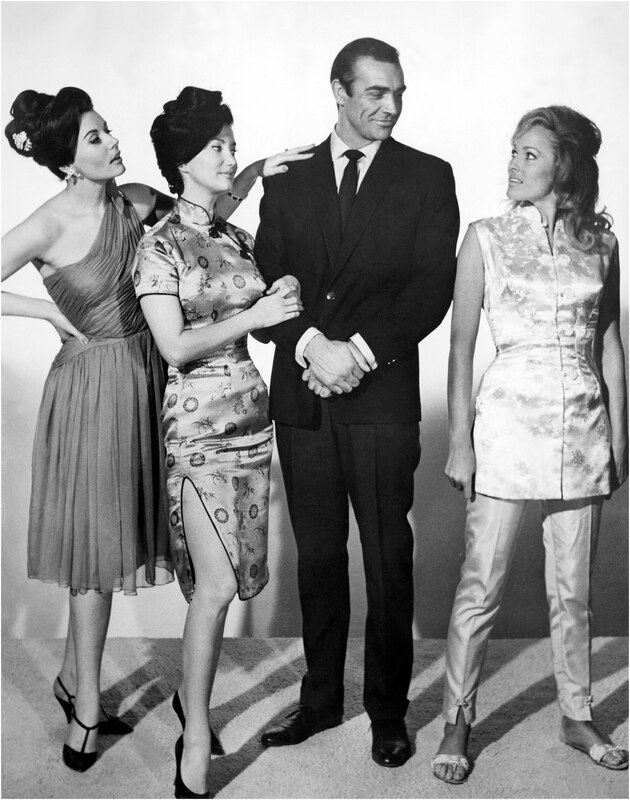 I found two promotional photos from Dr. No and From Russia with Love, in which the cap toe is visible. 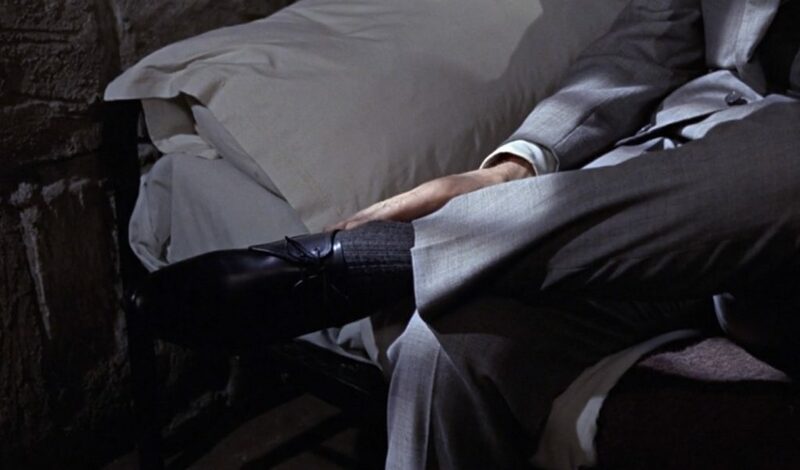 The Dr. No attire seems to be navy blazer/grey trousers that he wore in Professor Dent’s laboratory. It’s remarkable how slim and elegant Connery looks in the first photo!